We want you to be totally satisfied with the products and services purchased from our store.. 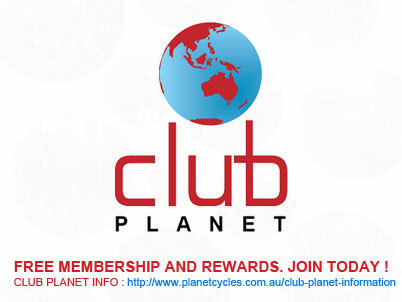 Returning your purchases direct to Planet Cycles is easiest and cheapest. But if you'd rather mail or freight it back and your purchase has a major failure, we will pay for the return freight back. There may be times when you will need to return a product purchased from Planet Cycles. When should you return a product? Where to return a product: Your product needs to be returned to Planet Cycles Pty Ltd at 1 Logan Road , Woolloongabba. Brisbane 4102. Phone 07 38919033. What information is needed to return a product? Show your purchase receipt or other proof of purchase (bank or credit card statement). Try to return the product in the same condition as it was purchased including packaging. For an exchange or repair we ask for your name, telephone number and or email address in addition to your purchase receipt. All purchases made on a debit/credit card will be credited back to the original card used, so please have your card with you. No cash refunds will be made unless they were purchased that way. Our Planet Cycles Store Manager can assist you with further information about the warranty period for the product you return. Expenses: Any expenses relating to the return of your product to store will normally have to be paid by you and freight expenses to the wholesaler of the product would normally also be paid for by the you the purchaser . Assessment of your product: Product Planet Cycles sells are covered by the manufacturer's warranty and as such are accessed by that manufacturer or wholesaler/importer of the goods before a decision is may to replace or repair a faulty product. Planet Cycles does not have the authority from Manufacturers or Importers to access their products on their behalf and because of this it is normal for Planet Cycles to return the product to the wholesaler before a warranty can be accessed and a decision made. Can a customer/purchaser talk to the wholesaler or manufacturer? For some product assessments you may have the option to liaise directly with the wholesaler or manufacturer. Our store members can provide you with the relevant manufacturer contact details such as email address or telephone numbers for such wholesalers. By post or courier: Mail or freight to Planet Cycles Pty Ltd at 1 Logan Road , Woolloongabba, Brisbane. 4012. Phone: 07 38919033 between the hours of 8:00am and 6:00pm AEST (Brisbane) Tuesday to Friday. The product problem or fault is deemed to be normal wear in tear in line with the products normal life span which can be determined in calendar months or years or with respect to cycling components how many kilometres a product has done and under what conditions such as off road, in the rain. Clinic Maintenance Course, Skills Clinic spacers or tickets. These Clinic spacers are sold similar to a concert ticket and while we allow a customer to on sell their space in one of our clinics or give their space to someone else we do not refund if you cannot come or cancelled . Manufacturers Owners manuals are provided at Planet Cycles for all bicycles sold and it's the responsibility of the purchaser to read carefully all the limitations of product purchased.